Traditional Harissa sauce is always a huge hit in my North African Couscous class. So much better than the commercial variety that comes in a tube! You will find it on every table in Tunisia. The large, mildly hot red chillies that are its main ingredient are grown in huge quantities to satisfy demand for this ubiquitous condiment. 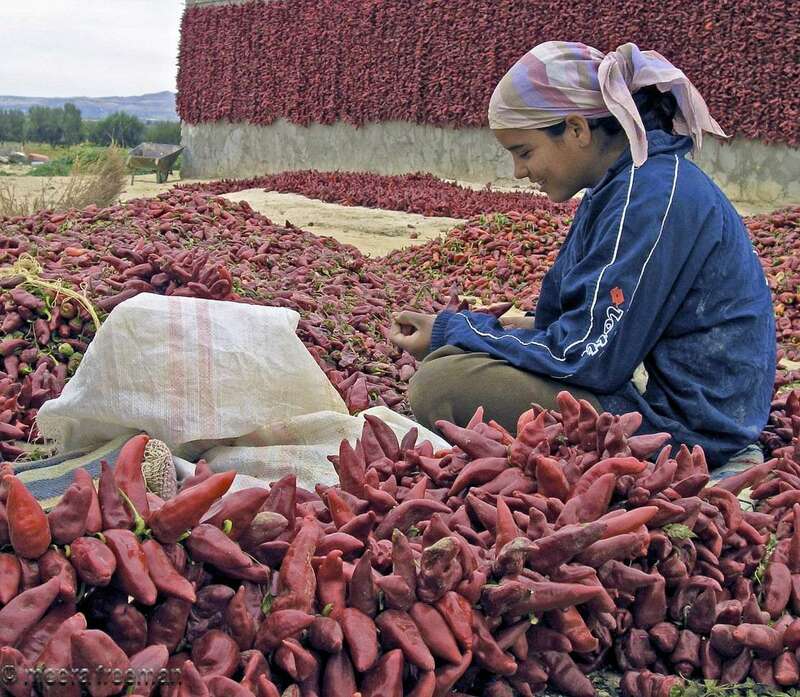 November is harvest time in Tunisia and the freshly picked chillies are threaded into long strings and hung out to dry on every available surface – an incredible sight! I took this picture in a field on my way, driving from Tunis to Kairouan in 2005. Drain the chillies and chop them to a puree with a heavy knife, then pound them into the garlic and spice mix until a fine, brick red paste is obtained. Serve as an appetiser with bread, tinned tuna, olives and lemon wedges. Dilute with hot water or broth and serve as a condiment for Couscous. Or, mix with extra virgin olive oil and serve as a dip for bread. Beautifully presented blog. Thanks for sharing your amazing photos.